Not short on new products to showcase to visitors at this year’s Naidex with seven new launches, Electric Mobility has reported enjoying considerable success with its new Rascal Vista and Vista DX mid-size mobility scooters amongst dealers, end-users and healthcare professionals. Aiming to fill a gap in the mid-size market with the 4mph scooters’ transportable features, the company exhibited the Rascal Vista in Sunset Orange and Vista DX in Oxford Blue on its busy stand this year. The Rascal Vista comes available with 35Ah batteries and Comfort Seat with a 23.6stone maximum weight capacity, whilst the Vista DX boasts upgraded features as standard, including an enhanced battery of 50Ah and a Captain’s Seat, as well as an extended range of up to 34.5miles. 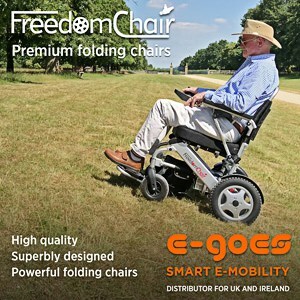 With both models fully dismantling into six easy-to-lift parts including their split battery packs, Electric Mobility highlights the designs enable people of all abilities, from end-users to carers and loved ones, to handle the transportable aspect. Providing dismantle demonstrations and test drives over the show’s two days, the Vista range was well-received by industry colleagues who welcomed the Vista and Vista DX as welcome additions filling a gap in the market for mid-size transportable 4mph mobility scooters, according to Electric Mobility. Elaine Leighton, Marketing & Communication Manager for Electric Mobility, commented: “The whole team were delighted to see such a great turnout at Naidex, with a buzz surrounding our stand as we exclusively launched seven new products. In addition, the company says comments from the show commended the Vista’s competitive turning circle of 1.7m and the sliding seat for extended legroom.